Disco Deviant have had another great year throwing a handful of excellent parties in Brighton, Oslo, Groningen and London. 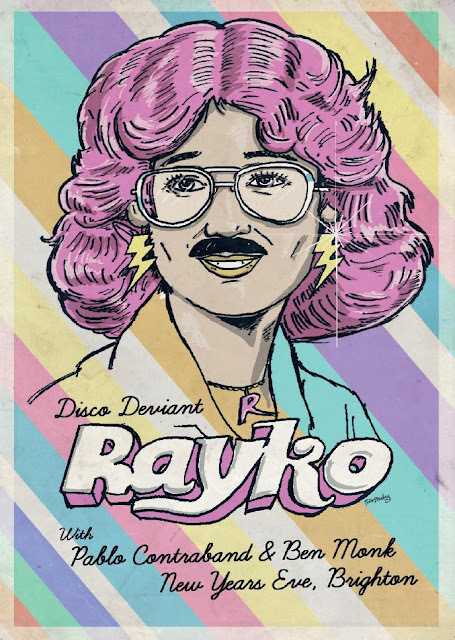 Disco Deviant's New Year's Eve party sees special guest Rayko jet over from Madrid to continue his global boogie crusade alongside chief orchestrator, Pablo Contraband and his close collaborator and fellow music fiend Ben Monk. This night is certainly an attractive proposition for the more discerning party goer with a soft spot for quality Disco, House and Boogie, without necessarily needing things to get too deep and meaningful. Fun is definitely high on the agenda with plenty of room left for dancing. The venue has been chosen with comfort and aesthetics in mind boasting panoramic sea views and stylish design. Pablo is well known for ensuring that the music sounds superb with clarity always a priority, therefore an excellent system will be installed at the venue especially for the party. All of this attention to detail and still the tickets are limited to 200 and held at a reasonable rate bucking the trend of new years eve's hyper inflated door prices and queues for everything.